The Jacksonville Sharks (6-3) head to Greensboro this weekend to take on the Carolina Cobras (6-2) at Greensboro Coliseum on Saturday, June 9 at 7 p.m. Tickets are on sale now at the Coliseum box office and Ticketmaster. With this year’s series between the two tied 1-1, Carolina looks to avenge their inaugural Week 1 home opener loss against the Sharks. In their two previous meetings, Jacksonville came out of Greensboro with a 41-38 win in Week 1, and in Week 4, Carolina left victorious, winning 55-21. Both teams are on a roll now, with Carolina winning their last two games and Jacksonville winning their last five games. Jacksonville barely has kept their win streak alive after scraping by the previous league leader Columbus Lions in a shoot-out. 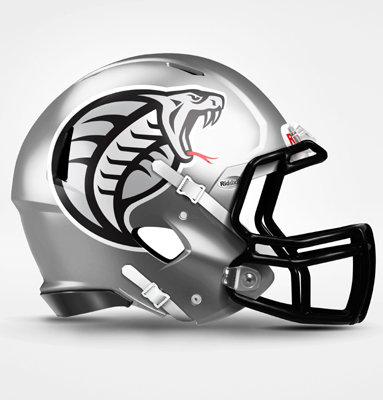 This win, coupled with Carolina’s 58-38 win over the Steelhawks, allowed the Cobras to take the top spot in the league. -The Cobras and Sharks lead the league in total points scored, with Carolina at 442 and Jacksonville at 409. -The Sharks and Cobras lead the league in sacks, with Jacksonville at 26 and Carolina at 17. -Derrick Ross: Ross is a big part of the Sharks offense, utilizing him on short runs to get first downs and touchdowns. He leads the league in rushing touchdowns by a mile, with 13. -Tyron Laughinghouse: Laughinghouse leads the league in touchdown receptions at 18. -Fabian Guerra: After being on IR during last week, Fabian Guerra looks to return to the scene and help propel the Cobras to a victory. His ability to get open on short slants and passes allows Carolina to more easily manage third and fourth down situations. Cobras: Avoid getting burned on the deep passes. Several times throughout the season teams’ receivers have exposed the Cobras’ defensive backs by getting separation from them and catching easy touchdowns. If the Cobras do this and minimize the amount of yardage from Ross, they will win. Sharks: Protect the ball. With defensive backs Michael Green and Cedric Poole in the backfield, it will be hard for McPherson to keep the ball with his offense. And with the Cobras’ high scoring offense, it is important for the sharks to capitalize on every possession.